This report includes a great deal of detail on every aspect of the 2014 London Borough council general elections. No other single volume presents the full results and election statistics from the 32 London boroughs enabling the reader to analyse and compare the results across London in one place. The report presents data for every candidate in every ward (excluding the City of London which operates on a different electoral model). The report also contains analysis of the European election results for London that took place on the same day. Printed Copies We are able to accept orders for hard copies £30. Click here for further details. Details of all previous elections reports in the series can be found here. 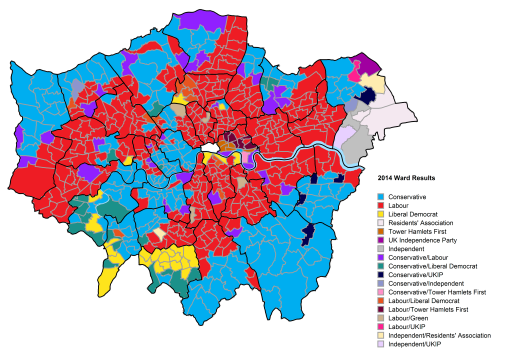 Summary results of the 2014 local elections in London, showing number and percentage of seats won, turnout and political control. These results show the number of votes for each candidate in each ward in London. Turnout, number of ballots, postal votes, and breakdown of rejected votes, Mayoral and European voting figures are also included where available. Map showing political control in each ward. Also, using these ward results, Oliver O'Brien from CASA has created some eye catching interactive ward maps. The borough map shows the summary results in both the 2010 and 2014 elections. 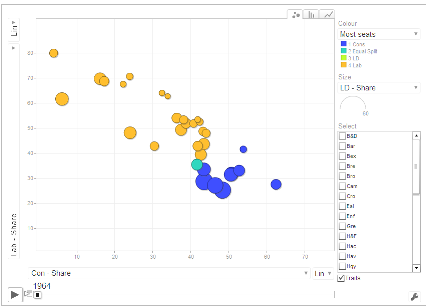 The ward interactive map shows the detailed results for each candidate at ward level for the last three elections between 2006 and 2014.